While the DH.2 may not be as famous as the later SE.5a and Camel, it ranks alongside them in importance in being the first true British fighter aircraft. Introduced at the height of the "Fokker Scourge", at a time when Britain was yet to develop an effective interrupter gear, the pusher-engined DH.2 quickly proved superior to the enemy Eindeckers which had hitherto been able to prey almost at will on the relatively defenseless RFC reconnaissance aircraft. With its rear-mounted rotary engine and fitted with ailerons (as against the Fokker's wing-warping) the DH.2 proved far more maneuverable than the German fighter, and effectively gained air superiority until it was, in turn, outclassed by the arrival of Albatros and Halberstadt fighters. The nose-mounted Lewis gun was originally intended to be moved in flight between flexible mounts, but this proved impractical and the gun was fixed centrally, allowing the pilot to "aim the aircraft" in the now-classic style. By mid-1917, the increasingly obsolescent DH.2 had been replaced on the Western Front, but still remained in service in the Middle East for some time, and continued to be used as an advanced trainer well into 1918. Altogether, around 450 DH.2 were manufactured, but none survived the end of the war. The moulding is superb throughout, with no flash or sink marks evident on the review sample. Ejector pin marks in the cockpit have been a slight issue in some earlier releases, but this time they've kept out of sight as far as possible - there are just two that may be visible on each half of the nacelle, tucked down beside the seat, so it'll be worth spending a moment filling them to be on the safe side. It's worth mentioning that a number of the parts have true-to-scale delicacy, and the price to be paid for the moulding excellence is some reasonably substantial sprue attachments, so I would seriously recommend anyone who doesn't already own a fine razor saw to consider buying one before starting work on this kit. The surface finish is fantastic, with crisply engraved lines and raised details, lacing and subtle wrinkling (inside and out) across the fabric panels on the nacelle, plus a drum-tight fabric effect on the flying surfaces with subtle rib tapes and stitching. An airframe of this nature doesn't lend itself to much by way of a dry-fit, but a quick check of the nacelle and lower wing is very encouraging. There's only a single locating pin on the nacelle - and, ironically, I'd be tempted to remove it anyway to avoid a faint step on the nose - but everything lines up very neatly. Interior side frames sit firmly on the floor, which clips solidly in place to form the base of the nacelle. The fuel tank cover slots on precisely, and there's a choice of front cowls depending on the armament arrangement. Both upper and lower wings are moulded full-span, simplifying construction, and are perfectly straight with nice thin trailing edges. The nacelle sits firmly on the front spar of the lower wing, with supporting ledges at the roots, providing a very solid foundation for the rest of the build. The tail booms are beautifully moulded, with the vertical struts in situ and angled to the air-flow, with tiny rigging attachments at their bases. The booms attach to suitably solid locating points on the wings, so the assembly should be good and sturdy when complete. The cockpit interior is very nicely detailed without being overly complex. There are approximately 20 parts, depending on the armament option you choose. Among the highlights for me are the beautifully delicate control column and the wicker effect on the seat, which runs right round, inside and out. The seat also features a nice wrinkled look to the separate cushion, and has an etched brass lap-belts. There's a choice of 3 instrument panel arrangements - each with pin-sharp decals (printed by Cartograf) for the faces of the dials. As far as I can see, any excess carrier film is minimal to non-existent, so application should be simplicity itself. Not quite so simple will be removing the moulded-on exterior fabric inspection panels for one of the colour schemes - and a hatch on the fuel tank cover which is clearly meant for a late-production version still to be released. You'll need to work carefully to avoid damaging surrounding detail. WNW offer a dual-purpose set of engine mouldings which double as a 17-part Gnome 100hp Monosoupape or the German licence-built Oberursel U1. The position of the spark plugs differed between the two engines, and as a small compromise the plastic parts include both, so you need to remove the German-style ones for teh DH.2. Luckily these are on the reverse side of the engine and will be largely hidden by the wings if you prefer not to spend too much time on the fiddly task of restoring the delicately moulded cooling fins on the cylinders. Turning to the wings, the interplane struts fit very positively into deep locating holes, and the locators themselves are neatly designed so you can only fit the struts the correct way up. With the DH.2 being a 2-bay biplane, there's no way you could really make assembly suitable for absolute beginners, but WNW's approach ensures it's about as straightforward as possible without unacceptable compromises in accuracy. There are more options on offer with different pitot tube styles, and then two types of gravity tank on the upper wing. Fitting the undercarriage completes what can be described as the first half of the kit's assembly, as WNW recommend rigging the wings at this stage. The undercarriage offers both open and streamlined axles, plus standard and "inside out" wheel mountings, and looks nice and solid, with good-sized locators to for a simple, sturdy assembly. The wheels are very nicely done, with a separate hub that features a nice taught spoked effect and reveal tyre air nozzles inside, while the Palmer Cord Aero tyres themselves have the maker's details in raised lettering. Assuming you do pause now to tackle the rigging, the instructions include excellent colour-coded diagrams to show not only the location and diameter of each wire, but also the cross-section (round or streamlined). Returning to the main assembly, it's time to fit the tail booms, fin and rudder, and horizontal tail. The rudder is fixed, while the elevators and ailerons are separate parts. Before rigging the tail assembly, you can take a moment to fit a choice of 2- or 4-bladed propellers. Once again, there's a colour-coded diagram for the rigging, with RAF or round section wire used in places, depending on the colour scheme chosen. Final assembly returns to the cockpit with the fitting of the Lewis gun on either central or side mounts, and external ammunition stowage. Depending on how confident you are of not knocking the delicate rigging, it might be advisable to add some of these parts earlier on. WNW's instructions have really set the standard in terms of presentation, and those for the DH.2 are no exception. Beautiful to look at with their "vintage" style, they include colour-shaded exploded diagrams, numerous reference photos, and written (English) notes for many points. Suggested colours are keyed to every detail, and Tamiya, Humbrol and Misterkit matches are provided, so you should have no trouble finding suitable paints wherever you live. The schemes offer plenty of painting options, with clear-doped linen, PC8 and PC10 flying surfaces, a variety of finishes on the nacelle, plus some attractive squadron marking. As noted earlier, the decals are custom-printed by Cartograf and are quite superb, as usual from this manufacturer. The thin, glossy items show perfect register and have virtually no excess carrier film. Colour density looks excellent, and there's a choice of fade blue and ultramarine national insignia. The distinctive white saw-tooth pattern on the underside of the 24 Sqn. machines' nacelle is provided as a decal, and the sheet also includes a good selection of stencil markings. We've rather come to take it for granted that each new WNW release is going to be pretty stunning - it's just a question of how stunning. Well, the DH.2 certainly doesn't disappoint. It's packed with detail yet, thanks to well thought out design and excellent instructions, even relative newcomers to WW1-era models should be able to tackle the construction. Of course, the rigging is another matter, and that is complex enough to present even seasoned veterans a welcome challenge. But, wow, will it be worth the effort! So, how best to sum up the kit? Oh yes... stunning! Unreservedly recommended. Highs: Superb moulding and fantastic detail throughout. Excellent instructions and decals. Lows: A few delicate modifications required for this version, so care will be needed to avoid damaging surrounding detail. Verdict: The DH.2 underlines WNW's hard to rival reputation for largescale WW1 aircraft kits, combining great detail and accuracy with excellent design for an enjoyable build. 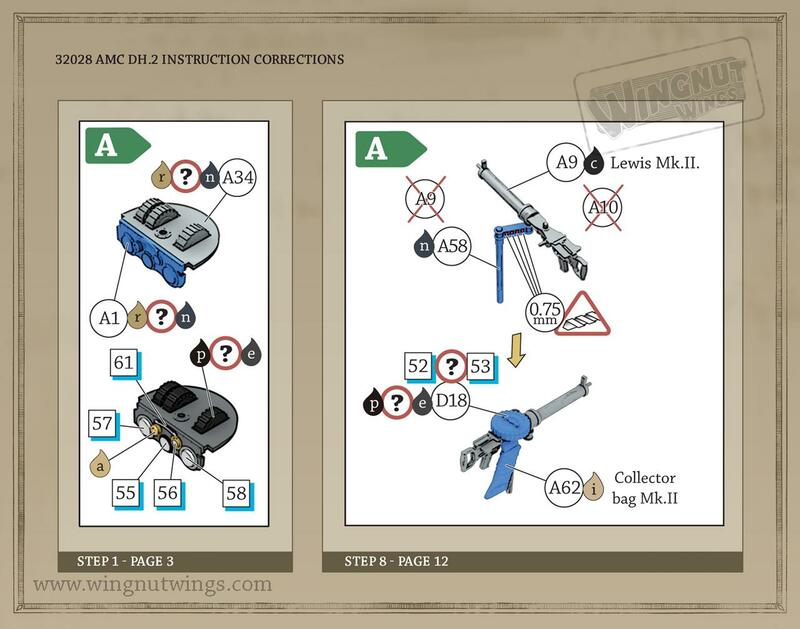 Here is an errata sheet from WNW on this kit. Did you get stung by customs Keith? Did you get stung by customs Keith? [/quote]Yep indeed, worse getting stung by Parcelforce for the honour of it (Tax is tax, fair enough but being double stung hurts.